Family & Childcare Resources of N.E.W. maintains a database of all regulated child care programs in our service area. Parents may access this database to obtain a free customized list of child care options in their area to make their childcare search easier. Choosing quality care is one of the most important decisions a parent can make for their family. 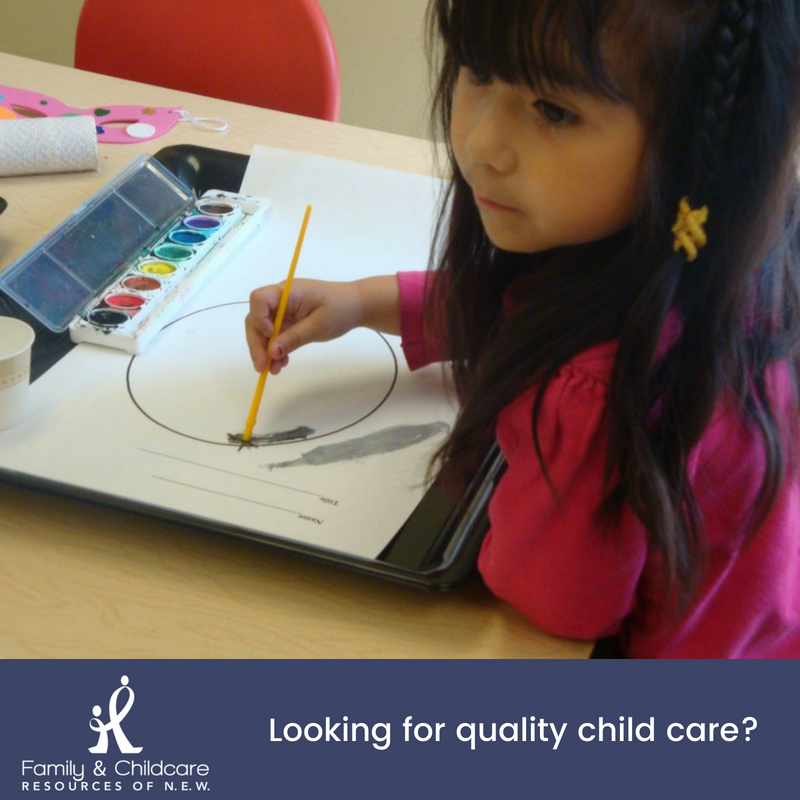 To receive a customized list of childcare options we will need you to answer a few questions to help us help you find the best options for care to meet your family’s needs. It can take less than 5 minutes for you to provide the information but we will take all the time you need to find your best options. You can use the online referral system or contact us to work with a referral specialist. To have a custom list created for you, call (920) 432-8899 or (800) 738-8899. Your list can be picked up, mailed, faxed, or e-mailed. You can access our online referral system. Some criteria can be harder to find matches for but with some work we can help you expand your options. If you do not find enough options from the online referral system please call to have a referral specialist help you find the best way to expand your search criteria. We will be sending out a feedback survey via email, in the coming weeks, to learn about your referral experience. Your e-mail information is not sold or shared with others. We can provide you with custom, computerized referrals to regulated family child care centers, family child care providers, and preschools in Brown, Door, Kewaunee, Marinette, Menominee, Oconto and Shawano Counties. We do not rate or recommend specific child care providers. It is up to you to evaluate the quality of care being provided by each provider using a variety of tools including the Youngstar Rating and Improvement System. Looking for child care in a county out of our area? Call Supporting Families Together Association at 1-888-713-KIDS to get the phone number of the organization that can help you best. Regulated childcare providers are persons trained in child growth and development. These providers are child care professionals and should not be thought of as “babysitters”. Anyone caring for 4 or more children under the age of 7 MUST be licensed by the Wisconsin Department of Children and Families. CERTIFIED AND LICENSED CARE GIVERS – Are persons trained in child growth and development. These providers are child care professionals and should not be thought of as “babysitters”. Anyone caring for 4 or more children under the age of 7 MUST be licensed by the Wisconsin Department of Children and Families. FAMILY LICENSED CHILD CARE – May care for up to 8 children in their home. The provider’s own children under age 7 years ARE included in the total count of 8 children. These providers are regulated through the state. GROUP LICENSED CHILD CARE CENTERS – Are those serving 9 or more children, usually in a center. These providers are regulated through the state. REGULAR CERTIFICATION – Providers have met all certification standards and have completed 15 hours of approved child care training. They are reimbursed at a higher level than the provisional certification. PROVISIONAL CERTIFICATION – Providers have met all of the certification standards, but have NOT completed 15 hours of approved child care training. They are reimbursed at a lower rate than the regular certification.